Jud Partin inspects a stalagmite in Taurius Cave on the island of Espiritu Santo, Vanuatu. A stalagmite such as this one could be used in a paleoclimate reconstruction. 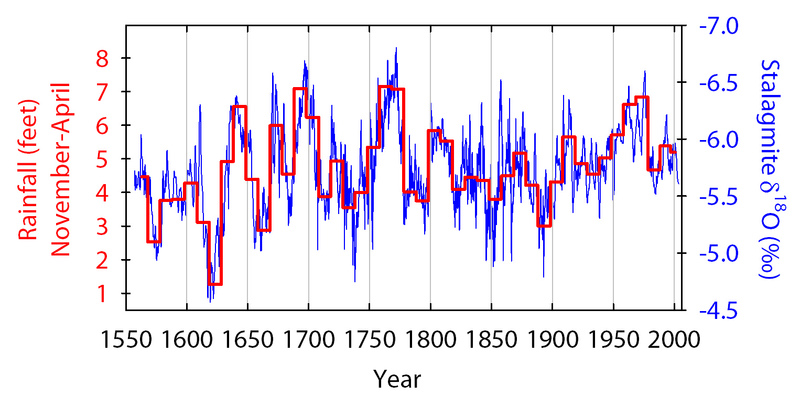 A new reconstruction of climate in the South Pacific during the past 446 years shows rainfall varied much more dramatically before the start of the 20th century than after. The finding, based on an analysis of a cave formation called a stalagmite from the island nation of Vanuatu, could force climate modelers to adjust their models. The models are adjusted to match the current levels of climate variability that are smaller now than they were in the recent past for this region. The researchers also discovered a roughly 50 year cycle of rainfall in Vanuatu, toggling between wet and dry periods. Vanuatu lies within the largest rain band in the southern hemisphere, the South Pacific Convergence Zone and its rainy season is from November to April. In the 20th century, rainfall during wet periods was about 7 feet per rainy season and during dry periods about 4 ½ feet per rainy season. However, before the 20th century, the dry periods tended to be much drier, with rainfall as low as 1 foot per rainy season and wet periods that were still getting about 7 feet per rainy season. This means there were differences as large as 6 feet per rainy season between dry and wet periods. “Without this record, you would not guess that this area could experience such large changes in rainfall,” says Partin. While 20th century rainfall in Vanuatu experienced a smaller range from wet to dry periods than in the previous centuries, the biggest difference was during the dry periods. Dry periods in the 20th century were much wetter than dry periods in previous centuries. The researchers note that this overall wettening of Vanuatu is consistent with the hypothesis that anthropogenic climate change, caused by the emission of greenhouse gases, makes wet areas wetter and dry areas drier. Rainfall in the South Pacific (red) varied much more dramatically before the start of the 20th century than after. Rainfall values are first measured annually during the rainy season (November-April) and then averaged over each decade. The blue line indicates actual oxygen isotope values used to determine rainfall values. The study was published online on September 6 in the journal Geology. Stalagmites are rocky features that form on the floors of caves as water dripping from above deposits minerals over time. By analyzing the abundance of oxygen isotopes deposited in the minerals of one particular stalagmite, the scientists were able to reconstruct a history of rainfall going back 446 years. This is significant because rainfall measurements in this region are sparse and only span the past century. Decadal averages of oxygen isotopes increase and decrease in lockstep with rainfall. 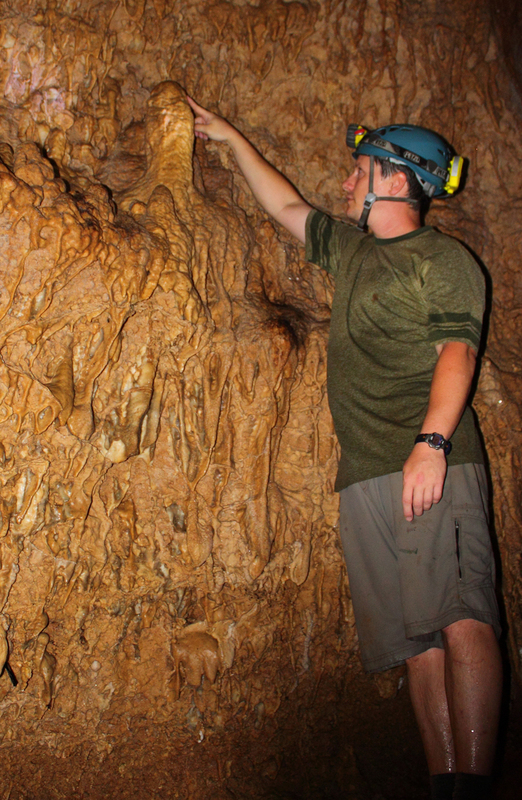 To convert oxygen isotope levels to actual rainfall values, the researchers calibrated the stalagmite data with actual rainfall measurements in Vanuatu from 1904 to 2003. The 50-year cycle of rainfall in Vanuatu does not appear to be linked to any external forces, such as changes in solar intensity. No correlation was found with the sun’s regular 11-year cycle of intensity or the Little Ice Age, a multi-decade change in climate possibly caused by solar dimming. The upper 25 cm (10 inches) or so of the stalagmite named Big Taurius from Taurius Cave on the island of Espiritu Santo, Vanuatu, which recorded large swings in rainfall over 446 years. Instead, the researchers propose that the 50-year cycle, or Pacific Decadal Variability (PDV), arises from natural fluctuations in Earth’s climate. The PDV causes the South Pacific Convergence Zone to shift northeast and southwest over time. At times, the zone is over Vanuatu (corresponding to wet times) and at others, it is farther to the northeast (corresponding to dry times). “This new result is part of a larger research program aimed at understanding climate changes in this important but understudied area of the tropical Pacific,” says co-author Terry Quinn, director and research professor at the Institute for Geophysics and professor in the Department of Geological Sciences. Partin’s other co-authors at The University of Texas at Austin are Frederick Taylor, Charles Jackson and Christopher Maupin at the Institute for Geophysics and Jay Banner at the Department of Geological Sciences. Other co-authors are Chuan-Chou “River” Shen and Ke Lin at National Taiwan University; Julien Emile-Geay at the University of Southern California, Los Angeles; Daniel Sinclair at Rutgers University; and Chih-An Huh at Academia Sinica, Taiwan. Funding for this research was provided by the National Science Foundation (award AGS-1003700) to Jud Partin, the Taiwan (Republic of China) National Science Council and National Taiwan University. The University of Texas at Austin is committed to transparency and disclosure of all potential conflicts of interest of its researchers. The university has not identified any such potential of conflicts involving this study.